Warranty Fraud Management provides a clear, practical framework for reducing fraudulent warranty claims and other excess costs in warranty and service operations. Packed with actionable guidelines and detailed information, this book lays out a system of efficient warranty management that can reduce costs without upsetting the customer relationship. You'll dig into the whole spectrum of warranty fraud, from simple sloppy procedures to systematic organized crime, and get to know the fraudulent parties, the victims, as well as the objectives and methods of the fraudulent activities in different scenarios. You'll learn how to implement controls to detect and reduce fraudulent claims and decrease the overall warranty costs. The impact of fraudulent claims is plainly spelled out alongside detailed descriptions of typical symptoms and process gaps present in diverse companies. A comprehensive, multi-modal framework for robust warranty management is presented as a template for revamping your own company's strategy. Fraudulent warranty claims occupy an estimated 3-15 percent of the average company's warranty costs, which generally average between 1-4 percent of sales. Many companies are unaware of the issue or struggle to take action against the claims for fear of upsetting business partners, or because they lack tangible evidence. 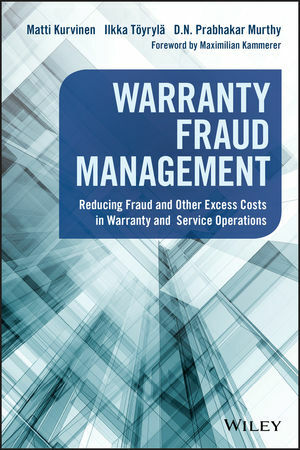 This book details a robust warranty control framework that institutes transparency and control over the whole warranty chain—supporting the process far beyond just fraud reduction. Warranty fraud is a major cost-control issue for most companies, but the sensitive nature of the topic leaves most reluctant to share their experiences and divulge their strategies. Warranty Fraud Management brings warranty fraud out into the open, and provides a clear, actionable framework for cost-savings through fraud reduction. Matti Kurvinen is an independent consultant focusing on service strategy and operations in general and warranty management in particular. After twenty-three years and various leadership and content expert positions in an international top-tier management consultancy, he started his own consulting practice in 2014. Ilkka Töyrylä, Dr.Sc., is a management consultant with over twenty years of both industry and consulting experience. His key areas of expertise include service operations and warranty management. His doctoral thesis on traceability studied different opportunities for utilization of item level product and serial number data, warranty management being one of the application areas. D.N. Prabhakar Murthy is professor emeritus at the University of Queensland in Brisbane, Australia, where he lectured on various topics in engineering and technology management for over 30 years. He has researched many different topics in reliability, maintenance, and warranty, resulting in many books and technical papers.